Canopy GrowthA Canopy Growth employee. The cannabis producer received a $US4 billion investment from the beverage maker Constellation Brands earlier this year, sparking the so-called “green rush” into the sector. The company sold 2,197 kilograms and kilogram equivalents, up 9% versus a year ago, while its average selling price of $US9.87 represented a 24% increase. “With extensive investments over the past year, including most notably in the second quarter, in branding and retail development, our entrance into the retail cannabis market has been a success with our SKU assortment obtaining over 30% listings market share in multi-store physical retail store networks nationwide,” chairman and co-CEO Bruce Linton said in the press release. 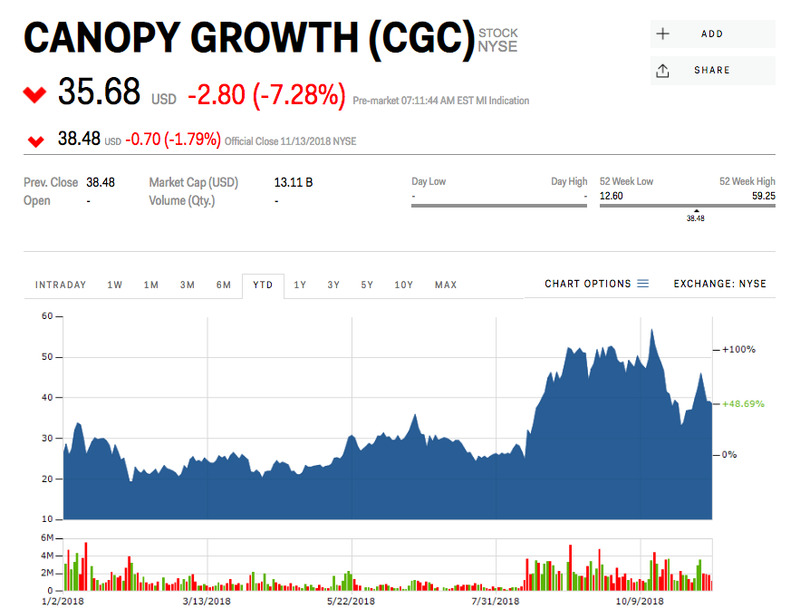 In August, Constellation Brands, the maker of Corona beer and Svedka vodka, announced a $US4 billion investment in Canopy Growth, sparking a so-called “green rush” into the sector, and causing companies across the industry to see their valuations more than double over a matter of weeks. The industry reamained in the headlines this fall as Canada became the second country to legalise marijuana for recreational use, and Michigan joined nine other US states and Washington, DC, in legalizing the drug for anyone over the age of 21.